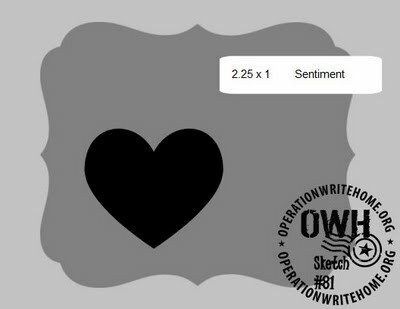 This year's Bloghop theme is "Thank You using a OWH sketch". I have been wanting to try something like this for a while...the hop was just the push I needed. I punched papers from MME using my SU hexagon punch. After I got the pieces all glued down I used my Spellbinders embossing folder and then hand cut the shape out. Added a little inking on the edges to hide any pencil marks. I used paper rafia and an OWH tutorial to create the "bow". Sentiment is by SRM Stickers. Seven different punches were used to create this card, which I think is a record for me. If you are just starting to hop you can click here to start at the beginning. Thanks for stopping by...I won't keep you as there is alot to see! Love the pop of color the Heart brings. Very cozy, quilty colors - all the curvy lines bring it together. I love the little paper rafia bow. Nicely done! 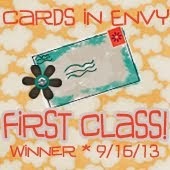 yikes....your card is so stunning I will have to put the hexie punch on my wishlist. Love all the DP you have used. Good use for the hexagon punch. It made a great quilt look. Love that bow also. Beautiful card! I like the heart with paper. Very cute! WOW--I love your unique and innovative approach to this. This is so cool. TFS! What pretty patchwork. Thanks for supporting OWH. Your card is amazing. I like how you used all those punches. Beautiful color combination too! I like the framing around the design and the paper is really nice. I really like the layers of punches on the heart- beautiful card! I apologize if my comment ends up posting numerous times - the 'puter is being a pest! Nifty Idea, and very creative! Pretty paper too. I love the use of the punch for the background page- what a fabulous idea! I love the texture you got in your pieced background. Wow! I love the hexagon background and can't believe you pieced that by hand and cut the frame by hand! The colors and papers you used are fantastic! All kinds of wonderful! Thanks for sharing and inspiring! Linda, this is a great card! I love your paper choices. I think the hexagon punch will be a "must have". Very nice, some hero will love this! I love your card. It reminds me of a quilt. I love the colors and the quilted look that you created with your punch. Cozy is a word I think I would use to describe it. It reminds me of snuggling under a nice warm quilt. Love the card. Great card. Did you piece the quilt or is that the paper's pattern? Love the colors. Wow! Seven punches... that's intense. :) Seriouslyk, though, this is cool. I like how you inked the edges and the embossing adds a really neat texture. Cozy is the word I would use to describe your card. It reminds me of snuggling under a nice warm quilt. I love the colors and the way you used your punch to create a quilted pattern. love your card & love how you did your "bow". I love the new hexagon punch! You made it look like a quilt!Love that you layered it on kraft paper. Makes it really stand out. This card has a very "homey" feeling by the use of the quilting colors & design. Linda--this is a great card, thanks for putting a "face" on sketch #81. Linda--thanks for putting a "face" on sketch 81--it's always great to see how sketches are interpreted. Beautiful use of paper. I love the colors in this card. Seven punches? You did a good job with combining them into a sweet card. Oh, wow!!! The detail is amazing! I love the way you made a quilt; now I'm going to have to try it. The papers all work so well together and I don't think I've ever seen paper raffia on a card before. I really like that little bow! Thanks for starting the hop out on such a pretty, homey note! This is such an amazing idea. I love how the quilting background looks. I will have to give this a try! Great way to start the hop. What a creative card. Beautiful colors. It reminds me of a handmade quilt, full of love. Thanks for being part of the OWH Memorial Day Blog Hop! I haven't tried this sketch yet but it's a must after seeing your cute card. I like the bow wrapped around the corner of the heart. great idea! I'm impressed that you cut the background piece by hand! Great job! I really love the quilt-look you made here! Such a beautiful card! You used two of my favorite things, die cuts and scraps. What a cheerful card. Good morning, Linda. Your embossed hexagons look great and I love the soft colors you chose. This card whispers "comfort" to me. Thank you for sharing your beautiful work. This card makes me want to curl up and find something special to read, I love the use of the different papers which are all pulled together by the heart. Oh my! This is gorgeous! I love the embossing, the colors and esp how the heart just "pops". I love the quilt look! The inking on the edges looks great as it covers your pencil marks, very practical. Love it! That "Bow" just sets if off so well and gives it that push over the edge to greatness! What a great way to start the hop! This is like getting a hug to go along with the "thank you". You did a fabulous job! I love punches and die cuts and really like the hexagon patter you used for this sample. Great work. Thanks. I love using dies and punches and really love what you've done with the hexagons on this card. Thanks. Nice mix of patterned papers on this card, Linda. I think the embossing really ties it together and makes the focal point stronger. Thanks for sharing! Love the look of a homey quilt on this card. Good job!!! What a cozy card. I like that you referenced inking the edges to hide the pencil marks, I do that too, it gives the edges a more defined look too. The embellished heart draws the eye. This is a nice card. love the quilted look and the texture added by embossing is awesome! The hexagons make a great touch! cute! Such a pretty card! I like how the red heart pulls out the red in those tiny flowers. I had no idea SU had a hexagon punch...another thing for my wish list! I really love how you made your hexagon quilt. I think I might try that. Your papers are very lovely! Love the quilt pattern and the comfy colors. Looks like a warm, cozy quilt! Will be a def. hit for an OWH card. Very impressive hand cutting the shape out. I love the quilted look of the hexagons. Cool way to use all of your punches. Love the vintagey look of this! Beautiful. I love that you waited to use your embossing folder, I'm going to try that one. Wow, this is gorgeous!! Great use of all those punches. Love the sponging around the edges too, really makes it pop. Wow... your card is outstanding. All those details you put into it. Thanks for sharing how/what you did to create this card. Holy punches, Batman! Seven? That's a lot...but the results are awesome...thanks for sharing! Love your card. The sketch is awesome. The colors are warm and friendly. Ann O. Love the idea of using the hexagon punch to create the quilt look. Love the card. The sketch is great and the colors are warm and friendly. Ann O. This is cool. I like all the layers on the heart. Love the quilted look you gave the paper! Your use of punches really gives the card wonderful dimension. Thanks for supporting OWH. Love the quilt look of the hexagons and the layers of the other punched pieces. Great card! Super pretty papers & layout! Very pretty card - love the papers & shape of the die cut. This is so pretty! I love how you made a quilt! I agree, reminds me of a quilt with the hexagon shapes...I'm also into textures and this card certainly has that! Reminds me of a quilt also. I love texturing and this card certainly has that! Love the honeycomb quilt and the colors here. SO pretty! OMG! Your card is gorgeous! I can't believe you punched all those hexagons out. I was going to compliment you on your patterned paper, but you made it yourself which is way better ;) Thanks for sharing your talents with us! love the surprising colors in this card. Great use of the hexagon punch to make a wonderful paper quilt! What a wonderful quilt looking background for your heart addition. This is an outstanding card design. Nice quilt pattern, look good on a card! Love the patch quilt look. The colors you used are beautiful, great job. Love the colors and the details....awesome card. I love the quilted look and I do remember now that bow on the heart. Why does my mind g blank when I sit down to make a card? Love the patchwork quilt DSP - so cute! The quilt look is adorable! I need to find a hexagon punch. Beautiful card, Linda, I love your soft colors and the punch work! A wonderful way to use this sketch! TFS and have a fabulous weekend. Your card is so great. I love to use the sketches. Super cute! I like the color combination. Love your use of the hexagons and the colors. The heart pops nicely. The bow is a nice touch! I've been wanting to try this technique, too. Love how it gives a cozy feel to the background, then how you popped the red heart for emphasis. Thanks for your participation in the OWH Blog Hop! So simple, but with so much heart! Lovely car! You did a fabulous job of cutting and piecing all of that together. Embossing over paper pieced patchwork - delightful! Really liked the pastel colors, and I agree it looks like a warm and cozy quilt! Can't wait to use my punches to case. I like the shapes and colors of this card.Great job! Love the patchwork paper! The heart POPS on top of it! Very pretty! TFS! Love the quilt look and your paper selection is great! I put the hex punch on my wish list. 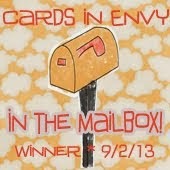 I like the colors you used and the quilt-y feeling to the card is comforting!! An amazing job creating the quilt look with all the punches. TFS and starting off this hop. Love the comforting feeling of the card. Love how you used the punch to piece together the focus shape for the card. Embossing added even more dimension. I love the quilt because it makes me think of home and good feelings. Hopefully it will do the same for our guys and gals overseas. Using the hexagon punch was a great idea! I have to try this. Your card looks so comfortable, I want to snuggle up in it. Very pleasing to the eye. Pretty card! I love how you used so many different papers for the background--almost like a quilt....do you think? Kraft cardstock makes a great base. I don't use it as much as I'd like because I know I have to line it for OWH! Great card. The texture adds that perfect quilted touch. I love the quilt look to the card. Linda, Love this quilted, vintage look. So creative! Definitely putting this punch on my gotta buy list. TFS! This is such a sweet card and I love that punch! Great use of punches, I really love your card. Love the design, great paper choices!!! Thank you for participating in this hop! I love how you punched them to make a beautiful quilt on a card. This is so pretty! I love the quilt idea and your papers work so well together! I like the comfy cozy quilt feeling. Feels like home. Love the warm and cozy feel. Nice colors! Love the warm cozy feel. Nice colors. I love the way you pieced the hexagons and then die cut them; very cool! Ditto to the last remark...a beautiful quilt! I love the embossing over the paper piecing. Great job. Reminds me of the quilts our grandparents made. Warm and comfy feelings. Love, this card! I really like all of the new hexagon themes...punches, embossing folders, stamps, etc. So versatile for both feminine and masculine cards. Love the color combos here...def looks quilt-y and I love that effect! Love the punched pieces It looks just like a quilt. Beautiful. How cute! I just love the quilted look! And 7 punches?! A lot of love and work went into that card! I just love the quilted look of this card! You can tell a lot of love went into making it! I just love the paper. It reminds me of a quilted bedspread my Mom made for me. The heart color embellishment really makes the card pop. Thanks for sharing! Absolutely beautiful! A great combination of papers adds to the cozy quilt look. Looks like some my Gr Gr Aunt used to make. Thanks for participating! Very pretty card. You have to love punches, makes cutting so easy and the cards so attractive. Thanks for sharing. Very pretty card. Love punches, makes putting together great cards a lot easier. I love the quilted look of the pieces on the card. The colors are beautiful together. It looks like a lot of hard work and time went into your card and someone will be very lucky to be able to send it home to their family. Great job! I love your card. It looks like quilt pieces put together. Very beautiful - a lot of time and energy went into putting it together and someone will be very happy to receive this from a loved one. Very pretty, I love how the patterned paper looks like a quilt. Super idea to use inking to hide pencil marks! You make me want to go punch, punch, punch! This is a wonderful card - love the kraft background to that lovely paper. And the red heart just pops! I really like the shape of this card face and love the colors you used, so sweet. Thanks for sharing. Great card! Thanks for inspiring me to use my punches more often! warm and cozy, the colors are great. What a fun technique. I really like how you created your own paper with the hexagon punches. I actually thought that was an actual pattern paper. But that is such a good idea. I honestly thought that was pattern paper. That is a such a great idea, great way to use all of your scraps. Love how it looks like a quilt. What else could remind them of HOME! Love how it looks like a quilt. Just what they need to remind them of HOME! I liked all the dimension on your card, and the patchwork really looks pretty. This is a great idea. Will have to try it. What a sweet card! I love all the texture and layers. Beautiful card. Love the hexagon shapes. For a quilter like me this has a particular appeal. It really speaks to 'home'. Nothing says "thanks" better than a heart and a warm quilt. Nicely done. Thanks for participating in the hop. Your patchwork card is so pretty. I can see any Hero sending this home to there loved ones. Such a good idea using the hexagons to make a quilt. Love this card! Hi Linda! I was doing the hop backwards so you're my last stop :) I cannot believe you made that quilted paper one piece at a time. It's fabulous! Thanks for joining in the hop and supporting Operation Write Home. Have a great Memorial Day!